Click Here To See Doctor Doom Thermofax Copy Which Is Included With The Art! Check out this very nice 1968 Pinup, which was drawn entirely by the KING: "Jack Kirby" This awesome Pinup features a nice large image of DR DOOM for a proposed (but unpublished) Marvel Calendar from the late 1960s era! 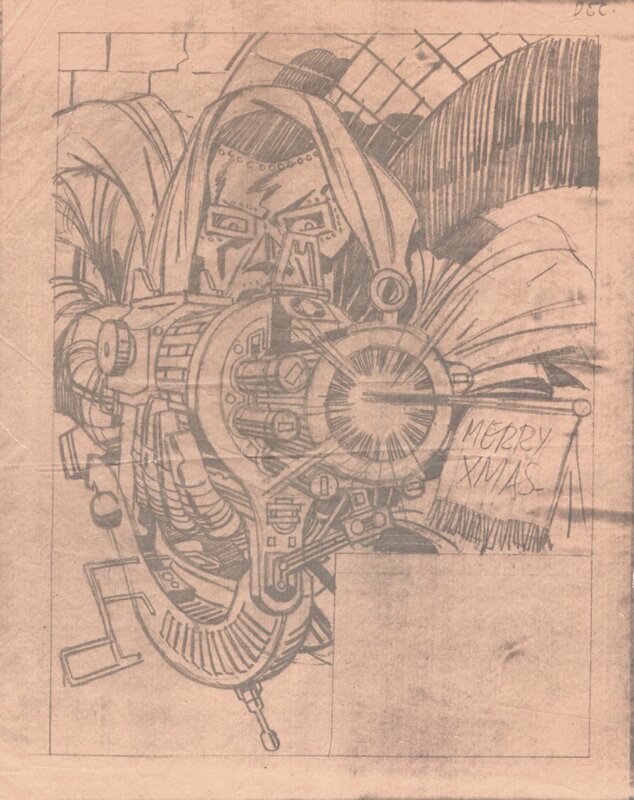 This was intended for the month of December, Doom's gun has a pop-out flag that would say "Merry Xmas." Drawn image area is 9.5 by 12.5 inches on 11 by 14.5 inch Bristol board. Art Comes with a vintage thermofax copy of the piece that has tanned and can be seen in the extra red link above. Art is signed at the bottom by Jack Kirby also! ALL art on our website (including this one) are able to be purchased with VERY fair time payments, and trades are always considered towards "ANY" art on our website! Just send us an email to mikeburkey@aol.com and we can try to work something out. Daredevil #13 p 3 (Large Art) 1965 SOLD SOLD SOLD! Jack Kirby AMAZING FANTASY 15 COVER RECREATION (1970s) SOLD SOLD SOLD! Tales To Astonish SOLD SOLD SOLD!